The manufacturers of this stuff follow the recipe and make their product which they call Ezekiel bread. It’s a good thing they didn’t read any further when they came up with the recipe because three verses later in Ezekiel 4:12 we learn that God wants to add other stuff to the recipe. Specifically human feces! The exact line from the bible reads: “And thou shall eat it as barley cakes, and thou shall bake it with dung that cometh out of man…”!! It cannot be argued that sprouted breads are healthy choices when compared to regular bread. The minerals in the grains are more available to the human digestive system and they contain more protein. But that does not mean that these types of bread are overall healthy foods, especially if you have sugar problems. The difference between sprouted breads and regular bread is mostly in the fact that while the latter is made from wheat flour, which is ground up wheat kernels, sprouted bread, is made from wheat kernels that have already sprouted. Because sprouts use up the sugar in the wheat kernels to make protein, Ezekiel bread has less sugar and more protein. But, because the kernels are typically not sprouted all the way, there is still sugar in Ezekiel Bread, not as much as there is in regular bread perhaps, but unless the kernel is completely sprouted and there is nothing left but the shell, you are still getting sugar. Just check out the nutritional facts that are printed right on the label. Every slice of Ezekiel Bread has 15grams or three teaspoonful of sugar in it. And most people are eating 2 or 3 slices. That means you’re looking at 6 teaspoonfuls of sugar if you’re eating a couple of slices. If you eat 3 or 4, that’s 9 to 12 teaspoonfuls of sugar. It’s not ordinary “table sugar”, its starch but it’s still going to get turned into sugar in your body, and it will raise blood sugar and create an insulin response. One of the most obvious red flags when it comes to sprouted breads like Ezekiel Bread is that fact people really like it! And what is it that makes Ezekiel Bread such a popular alternative among the blood-sugar -conscious folks who try it? It’s probably not the fat because there’s only about ½ a gram of fat per slice of the stuff. And it’s probably not the protein, because there’s isn’t a lot of protein either. There’s a little fiber, but people don’t exactly go crazy about fiber. And you don’t see a lot of folks going out looking for sprouted barely or millet either. The reason people like Ezekiel Bread is the same reason people like most of the foods they eat. It’s the carbs! And the carbs in this sprouted bread are the same as the carbs in any kind of bread, (although the fiber, can slow down the release of the sugar). Any way you describe it, the facts it is carbohydrates mean sugar! An average slice of white bread has around 20-25 calories, but an average slice of Ezekiel bread has 80 calories. There are over 3 times more calories in a slice of Ezekiel bread then there is a slice of white bread. And these are sugar dense calories. In fact NOT including the fiber (which is non-caloric), almost half the calories from Ezekiel Bread come from carbohydrates/sugar. It may not be pure sucrose or table sugar. It may be in the form of starch, but it will still have an effect on your blood glucose. 3 teaspoonfuls of sugar per slice! Ezekiel bread does have some protein value, so it’s not as bad as white bread or cake or pasta, which are awful and empty foods, but it’s still a load of sugar; sugar that you don’t need. This is why we have to be savvy, why we have to be nutrition label readers. No one can deny that sprouted breads are better that regular bread, but if you are diabetic or concerned about blood sugar I’d avoid them. And, if you have leaky gut problems or Celiac Disease, or any digestive issues, it important to recognize that sprouted bread still contain gluten and allergenic proteins. Sprouts are great, but Ezekiel Bread isn’t sprouts and it doesn’t taste anything like sprouts In fact it looks and smells and tastes like bread. A heavy, thick somewhat unusual bread but a “bread” nonetheless. If we’re having blood sugar problems, and we know we should be getting off the bread, we’re kidding ourselves if we think the solution is to start eating a different type of bread, Ezekiel or otherwise. What we should be attempting to do is wean ourselves off of the bread habit and the bread taste. 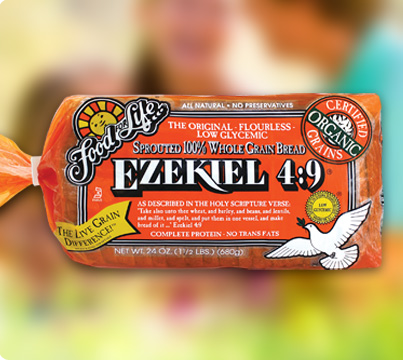 I’m not beating up on Ezekiel or any other sprouted bread. I’m just saying let’s not be fooling ourselves. Look on the nutrition facts. If it’s says carbohydrates, that means sugar and that means elevation in blood glucose and insulin and that means beware if you’re a diabetic or pre-diabetic. There’s just no other way you can slice it.